The presentation of information on these pages is to assist the public to understand the various types of device that are in development. It should not be interpreted as an expression of a preference regarding a particular device type or a specific manufacturer. The latest information on each device can be obtained through the respective websites. Other new ideas and concepts are frequently aired by the industry. Horizontal Axis Tidal Turbines - These marine turbines work in the same way as wind turbines but are driven by the flow of water rather than air. As the density of water is much higher than air (over 800 times) and has a much slower flow rate the turbines experience larger forces which leads to smaller diameters. Some devices operate best in bi-directional tidal flow conditions, whereas others are able to change direction to face the strongest flows at different stages of the tidal cycle. In recent years the concept of the horizontal axis turbine has been adapted, to include an open centre to the device, as per the example below. Oscillating Hydrofoils – These work by the tidal current flowing either side of a wing or hydrofoil which results in lift. The lift force can be made to apply in an opposite direction when the hydrofoil changes angle through its oscillating cycle. The motion can then be used to drive fluid in a hydraulic system to be converted into electricity. The motion can either be an up and down motion, or side to side. Venturi Effect Devices – These work by housing a device within a duct with a funnel like collecting device. 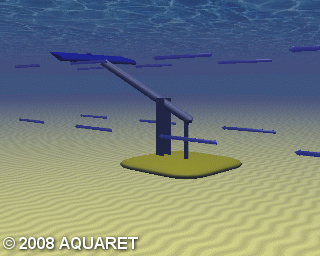 This sits in the tidal stream and concentrates the flow past a turbine or system. The flow can either directly turn a turbine or induce a pressure differential in the system to drive an air turbine. The turbines housed within the funnelling casing can be either horizontal or vertical axis. 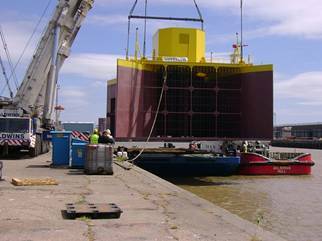 By having a casing the tidal stream can be manipulated further prior to reaching the turbine to focus the tidal flow with the addition of remotely controlled shutters, as per the example below.